#210: New Jersey 2017 Gubernatorial Election | mark Joseph "young"
This is mark Joseph “young” blog entry #210, on the subject of New Jersey 2017 Gubernatorial Election. New Jersey tends to be blase about our off-year elections–no President, no United States Senators, no United States Congressman, why bother going to the polls? Yet this year the election is not insignificant. Every elected State office is on the block, from our Governor and Lieutenant Governer to all forty of our State Senators to all eighty of our State Assemblymen. Additionally, there are two ballot questions put forward, asking the voters to approve spending more money. That’s certainly more than we can cover. We’re going to limit our attentions to the state-wide issues–that is, the gubernatorial ticket and the Public Questions. We begin with the governor’s race, and follow-up with the Public Questions in a future post. New Jersey’s governor serves for four years, and can serve up to two consecutive terms. Current Governor Chris Christie, considered by political pundits the most moderate Republican governor in office, is coming to the end of his second and thus is ineligible to run again. 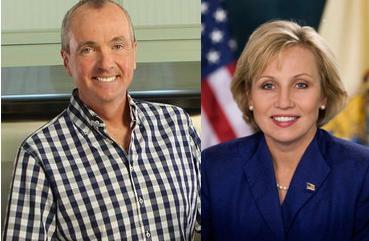 His Lieutenant Governor, Kim Guadagno, heads the Republican ticket. Guadagno has not been a rubber stamp for Christie. She opposed the recent gasoline tax bill, which Christie supported, because she saw political maneuvering around it to increase state spending beyond what the bill promised to raise. Among the leading campaign promises, she has a plan to at least cap if not reduce property taxes, by tying a ceiling on the education share of property taxes to household income and making up the difference in education costs from a state fund. She also has plans to fix the state’s pension and health benefits programs, and talks of improving conditions for veterans. Her running mate is Cuban-born Woodcliff Lake Mayor Carlos Rendo. Rendo’s family fled Cuba, and he grew up in Union City, graduating from Emerson High School, with degrees from Rutgers University and Temple University. His 2015 mayoral election is his earliest reported involvement in politics, but his degrees are in political science and government, and law. Observers are expecting a strong victory for the Democratic slate, giving that party control of what they call the “trifecta”, both legislative houses and the executive. The Democratic nominee is Phil Murphy. Murphy’s political background includes being National Finance Chair of the Democratic National Committee and serving as Ambassador to Germany. Otherwise most of his experience is in economics, primarily at investment banking firm Goldman Sachs. His platform focuses on trying to bring innovation back to New Jersey–leader in invention from the time of Edison to the end of AT&T’s Bell Labs–and so improve the economy. He speaks of increasing funding for education, but does not suggest whence this money will be obtained. His running mate is New Jersey Assemblywoman, former Assembly Speaker, and one-time United States Senate candidate Sheila Oliver. Oliver is strongly liberal, but has not been a popular candidate outside her district. There are five other gubernatorial candidates in the state race. The Libertarian party is supporting Peter Rohrman, with running mate Karese Laguerre. Neither have any experience running for or serving in elective office; they put forward the standard Libertarian platform of less government. The Green party offers Pastor Seth Kaper-Dale, a Reformed minister who has been involved in social causes. His running mate Lisa Durden is a political commentator, formerly a professor at Essex Community College terminated after making public statements supporting a decision by a local chapter of Black Lives Matter to hold an event open only to African-Americans. Neither has any experience in elected office. Veteran Marine Matt Riccardi is the gubernatorial nominee for the Constitution Party; they did not register a running mate for the lieutenant position. His ticket is focused on reducing taxes across the board and increasing jobs in the state. Riccardi is new to the political process. Former Long Hill Mayor Gina Genovese is running on the Lower Property Taxes ticket; she is also cited in the press as the LGBT candidate. Her running mate, Derel Stroud, has been a state Democratic party political organizer since 2009. The We the People party has placed as official candidates on the ballot the ticket of Vincent Ross and April Johnson. Both candidates are unknown in the political and online worlds at this point. Those are the candidates, in brief. Much can be learned about them online once you know their names. The Democrats are thought to have a strong lead, but the Republicans do have a chance, particularly in an off-year election when younger Democratic voters are less likely to go to the polls. So plan to vote Tuesday if you have given thought to the future of New Jersey and the directions the candidates would take us. Watch for an upcoming article on the public questions. Pingback: #214: New Jersey 2017 Election Results | mark Joseph "young"